There is a plethora of options for accommodation around the national park, either on the Brazilian or Argentinian side. The usual necessities for a day out in the sun apply here - sunscreen, sun glasses and a hat. There are plenty of water fountains throughout the park, so bringing a refillable water bottle will save you time queuing in cafes or gift shops. You'll have to accept that you're going to get a little wet, so lightweight clothes which will quickly dry out in the sun are a good bet. For your electrical equipment, make sure to bring a plastic bag, or a small dry bag if you have one. Plastic wallets to protect smartphones can be bought cheaply in both parks. 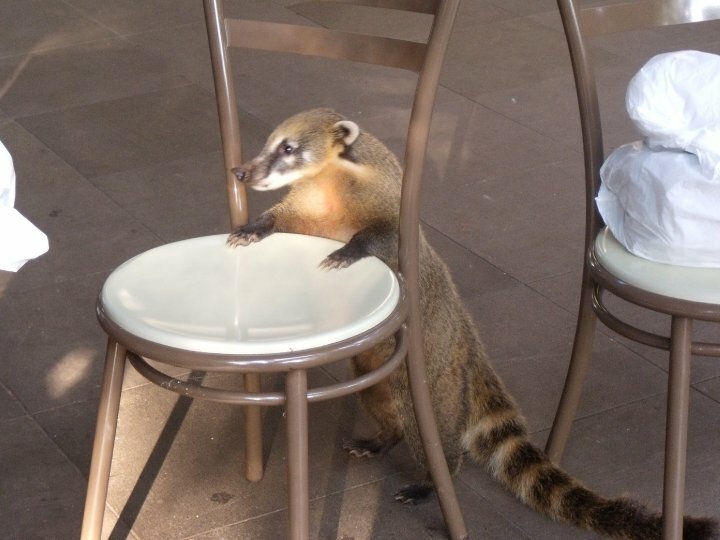 If you bring a packed lunch or snacks, be aware of the coatis and monkeys which live on both sides of the falls. They are very bold and will happily relieve you of your food if you don't pay attention. Getting a scratch from one of these is pretty nasty, so don't be complacent while eating and make sure all your rubbish goes safely in the bin to avoid attracting them into dining areas. The Brazilian side of Iguazu Falls (or Iguaçu in Portugese) is easily reached from the town of Foz do Iguaçu. For an educational and stress-free experience, it's worth including a private or small group tour in your package holiday. 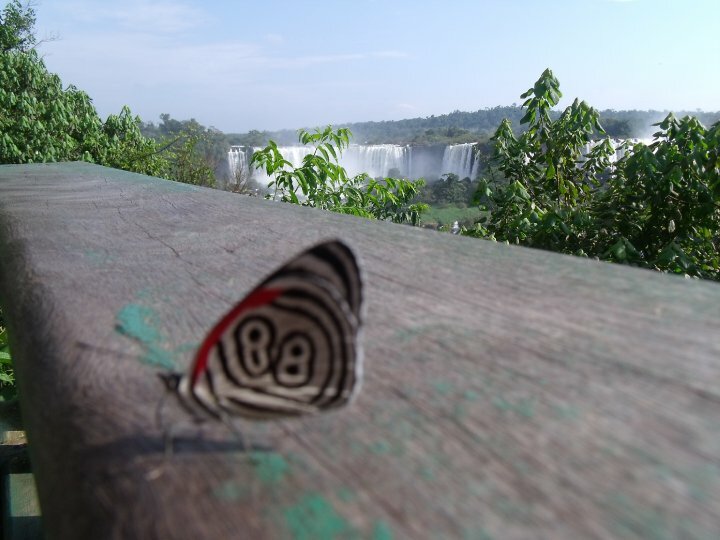 This is the place for the picture postcard, panoramic views of Iguazu which you've been expecting to see. The huge scale of this vibrant wall of water, moving and roaring like a living thing, is simply mind blowing. You may be surprised by the streaks of brown which mark the water as it powers over the rocks and thrashes up sediment. Make no mistake - Iguazu is not fluffy and beautiful. It is raw and brutal and absolutely breathtaking. There are several gangways and viewing platforms here, designed to take you right into the heart of the falls. Remember to protect your camera from the pervasive spray as you line up the perfect shot. For a novel end to your time on the Brazilian side of the falls, try visiting, the bird sanctuary, or Parque das Aves, near to the entrance. Here you can spend time with parrots, toucans and macaws, among other exotic species. You can also have your photo taken with some of the tamer birds. Just the other side of the border lies the Argentinian Iguazu National Park. Crossing the border is easy and painless if you take a pre-organised tour, although it is also possible to make the trip using public buses. For British passport holders there is no fee to cross into Argentina. Other passport holders should check their status before attempting to cross, as some foreign tourists are charged hefty visa fees. Where the Brazilian side is all about stunning panoramic views, the Argentinian national park is more a day of exploration. Boarded walkways offer a selection of routes through bright woodland, some leading down to the pools at the bottom and others looping round the very top of the falls. This is your chance to get close to the action, passing through rainbows refracting through dense mist and venturing out onto pathways suspended right in middle of the crashing water. On this side of the border you don't just see the falls, you feel them. One of the particular charms of the Argentinian side is the number of beautiful butterflies which can be found along the trails. Settling on handrails, sun hats and brightly coloured t-shirts, they add a welcome flash of colour and a whole other layer of fascination to the falls. If the bridges and walkways which navigate Iguazu aren't enough for you, taking a boat ride out into the Devil's Throat itself should be the thrill you're looking for. 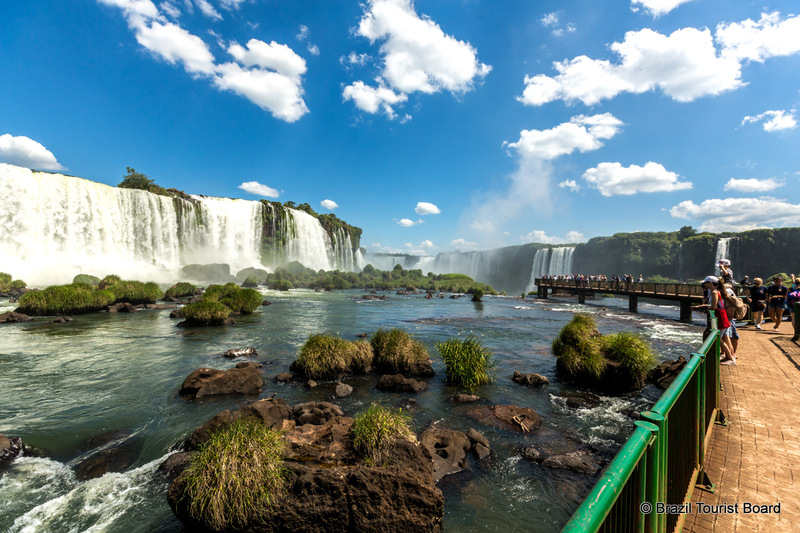 These tours are available on both the Argentinian and Brazilian sides and involve a thorough soaking as the boat edges as close to the tumbling water as it dares. Dry bags are provided to keep your possessions dry, as are life jackets. Unless you have a GoPro it's wise to keep your cameras away for this one. There are plenty of cafés serving hot and cold drinks as well as basic sandwiches and snacks in both national parks. Unsurprisingly, everything (including the Subway) is very overpriced and of pretty average quality. Consider bringing a packed lunch, or, if you want to treat yourself, go to either the restaurant section of Porto Canoas, which is situated at the end of the Brazilian trail, or to one of the restaurants situated within Hotel Das Cataratas, which is again on the Brazilian side. In the Argentinian park, try the Sheraton’s in-house restaurant, Restaurante Garganta del Diablo. At the throat of the devil, it's not difficult to feel small. The air shimmers with iridescent droplets, shakes as tonne upon tonne of roaring water empties itself into the cavern below. As thick spray sticks hair to scalp and soaks clothes to skin, the force of this natural wonder is rendered vaguely terrifying and, at the same time, leaves the viewer completely exhilarated. Iguazu Falls is its own creature, a series of waterfalls collected on the borders between Brazil, Argentina and Paraguay, fed by the Iguazu River. 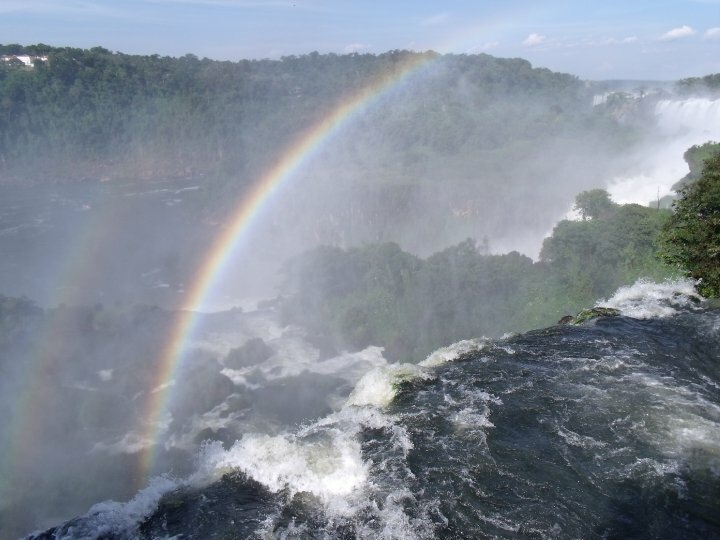 With an average of 1,500 cubic metres per second rushing over the Paraná Plateau, it is one of the most dynamic and awe inspiring sights in all of South America. No surprise, then, that it has been named one of the natural wonders of the world. As for the Devil's Throat, a churning mass of water and spray, not much compares to the chance to peer into its depths. Two full days are required to get the most out of the falls, one on the Brazilian side and one on the Argentinian. The two national parks, both UNESCO World Heritage sites, are easily accessed from either side of the border, and offer two unique perspectives on an extraordinary show. This exciting holiday takes you to Brazil's top spots including Iguazu, the Amazon and Rio in just over two weeks. 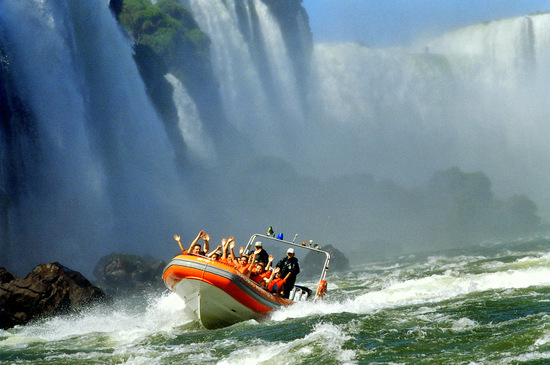 This 12 day adventure takes you from city to beach via the ever-powerful Iguazu Falls. Take the slow road and discover the best of Brazil over three relaxed weeks.